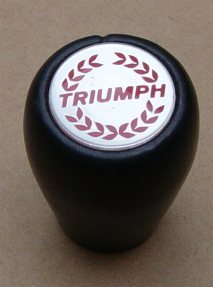 Highly-polished wood gearknobs are available for all cars without gearknob-mounted overdrive switch. Self-cutting screw-on fitting. Supplied with a choice of acrylic top badge (late type laurel wreath usually fitted to Dolomite/Sprint/TR7 all others usually fitted with earlier type shield - but its up to personal preference). Badges are available separately. They are also suitable for keyfobs, road wheel centre, steering wheel centres, and many other applications. They are constructed of high impact plastic with self adhesive base, the diameter measures 28mm. Priced at £2.80 each. Want a wooden steering wheel to match? Leather gearknobs are available for all cars without gearknob-mounted overdrive switch. Self-cutting screw-on fitting. Supplied with a choice of acrylic top badge (late type laurel wreath usually fitted to Dolomite/Sprint/TR7 all others usually fitted with earlier type shield - but its up to personal preference). Want a leather wheel to match? 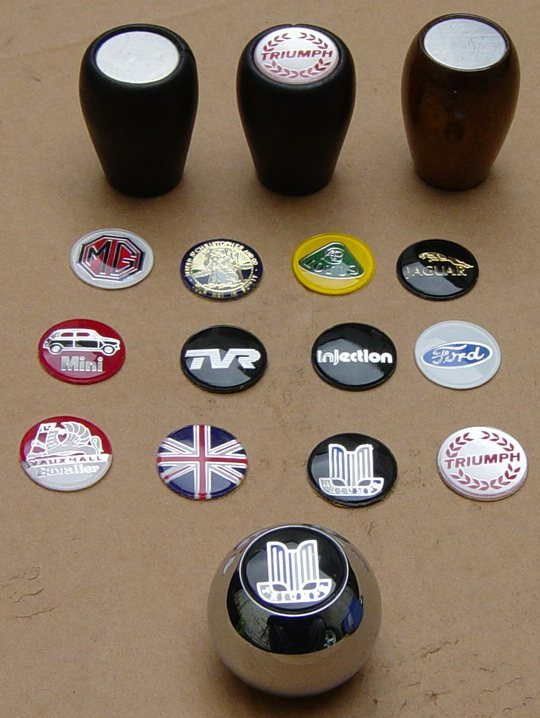 We can supply badges for almost any car. A small selection is shown above.